For most electricians, no job can be done effectively without a multimeter. In fact, a multimeter is the most important tool any professional electrician should have in his tool cabinet. This is why it is important to select the best multimeter when looking at the market to buy one. If you intend buying a new multimeter or replacing the old one you have, you may want to consider one of the best in the industry today. Below, we shall have a critical review of the Tek Power Wireless Multimeter pointing out its features, pros and cons. Do you know that the Tekpower TP9605BT is the world’s first digital multimeter with Cell phone APP connection? Well, now you know. 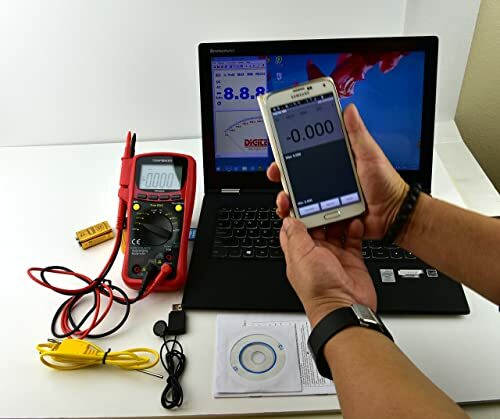 This multimeter is built with two way connection: Android cell phone connection and also connectivity with windows PC via USB. Grab the Tekpower Android app for cell phone connections and the software app for USB-PC connections. This feature allows you to post or share measurement readings and results on social media or by email. It also displays readings in the form of lists or charts. 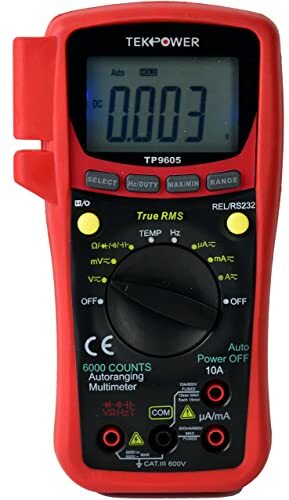 The Tekpower TP9605BT wireless multimeter features a fully functional 6000 count true RMS measuring system with intelligent connections, USB and Android cell phone connections. It also has an automatic ranging function with a manual override. This wireless multimeter comes with a K-type thermo sensor feature that allows you to conduct the temperature measurement during operations. It also comes with an optical USB cable that enables you to connect the meter to your computer. Like we have said before, the Tekpower multimeter is the world first model with cell phone connection. You should also note that the Tekpower Android app download is free and so is the data-logger software for PC connections. 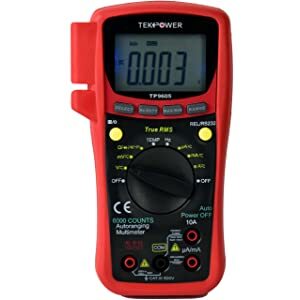 In general, the Tekpower TP9605BT wireless multimeter is one of the cheapest auto-range meter available on the market. Given that it possesses functions and features that other similar or more expensive multimeters lack, it is worth a second look. It is the best multimeter, especially for amateurs and beginning electricians who want the safest working tool for better job efficiency. There are many multimeters on the market today and it can be quite a challenging task to select the ideal one for your electrical repair needs. Only very experienced electricians can differentiate between a poor tool and a high quality one. 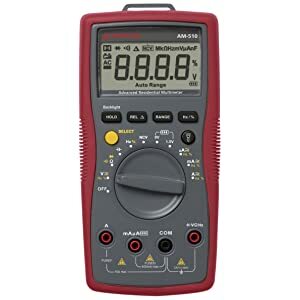 If you are about to go shopping for a multimeter and you have not made up your mind yet on the best multimeter to buy, this review will help. We will look here at one of the best multimeters in the industry based on customer feedback and their overall ratings on eBay, Amazon and other retail websites. The Innova 3340 can also be used in a wide range of applications such as checking battery voltage and alternator output, verifying voltage to light sockets, measuring inductive RPM pickup and vehicle RPM (including coil on plug vehicles), troubleshooting relays and verifying electrical continuity. 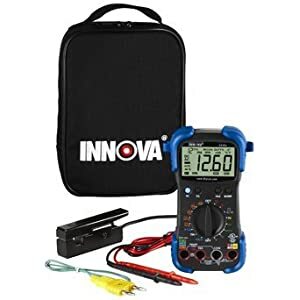 The Innova 3340 series is a UL certified electronic product which features a professional automotive multimeter design that helps identify engine associated problems. It also features an auto shut-off mode which turns the device off after a period of 30 minutes of inactivity to conserve the battery. This model also has a probe holder on the body of the meter that stores probes when not in use. This multimeter device comprises of a temperature probe that enables the user to measure temperature accurately. It also allows the user to measure temperature in both Celsius and Fahrenheit units. The 3340 series characterizes test alternator diodes which determine whether the circuits’ diodes work properly. It includes test lead holders which provides for hands free protection. Other features present in the Innova 3340 digital multimeter include an auto-ranging feature, overload protection, automatic zero adjustment, reverse polarity protection, inductive RPM clamp, min/max hold buttons which save retried data and a compact carrying case. It is definitely a must have meter for automotive fanatics. 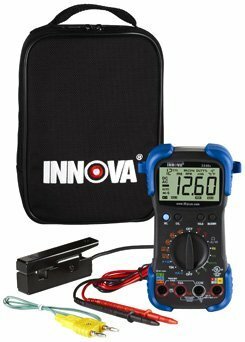 The Innova multimeter is one of the best current-testing tools on the market today based on customer reviews and overall user ratings. The product has great features any electrician would love. Inasmuch as the Innova 3340 automotive digital multimeter has some slight flaws, for a budget multimeter it is still very functional. These multi-use testers have many new and ground-breaking features. This multimeter has all the features to make your work quite easy and stress-free. It is also available in different languages which means that you will definitely not have any issues using this multimeter for your electrical works. If you are looking to buy the best multimeter, this model is surely an investment worth making for automotive specialists. 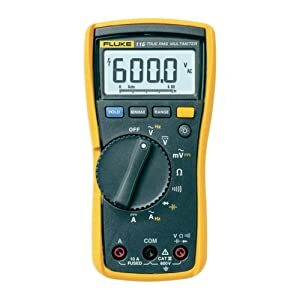 The Fluke corporation once again proves itself as a champion in the market of electronic and application testing tools providing the best multimeter for work efficiency. With the series of Fluke multimeters, it has once again helped to define and grow an exceptional technology market providing testing and troubleshooting solutions. This in turn has aided a lot in problem-solving and productivity gains in manufacturing and service industries. The Fluke 115 compact True-RMS digital multimeter is one of Fluke’s tools for field service technicians which is ideal for electrical and electronic test applications. It has several features any experienced electrician will love. This review is dedicated solely to the Fluke 115 multimeter as we concentrate on its features, pros and cons. The Fluke 115 has a large LED display with backlight that provides you with adequate lighting when you are working in dark places. The large display makes it easy for you to view readings. It also features a maximum voltage AC/DC 600v. It allows you to check continuity, frequency, resistance and capacitance. This multimeter features an average/max/min which helps you to understand fluctuations in signals. It has a 10A current measurement and 20A overload with 30 seconds momentary. This means that you will have a testing tool with the highest recognized safety standards at your disposal when you opt for this multimeter. Generally, the Fluke 115 compact True-RMS digital multimeter is a meter that will give you accurate voltages and current measurements. It comes with lots of accessories, a great manufacturer’s warranty and a nice variety of attachments. 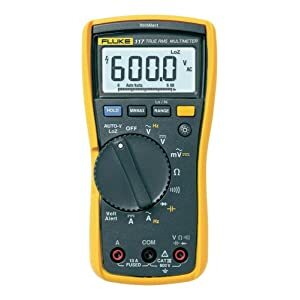 If you are looking for the best multimeter, Fluke 115 is surely up there as one of the finest the industry has to offer. 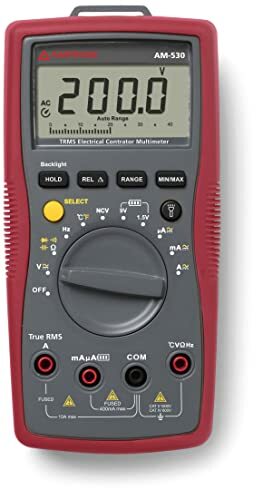 A multimeter is an electrical testing tool that measures multiple properties of an electrical circuit such as current, resistance, voltage, continuity, frequency and capacitance. They come in various models ranging from hand held models to models that require support like stands. If you are looking for the best multimeter for your electrical needs, the Amprobe 530 RMS electrical meter is one fine option. This meter comes with a K-type thermo sensor for measuring temperature without the need for a separate thermometer. It is also designed with non-contact voltage detector which detects AC voltage without making contact with the circuit. Below are the features, pros and cons of the Amprobe AM-530 multimeter. Designed and built by Amprobe manufactures in the USA, the Amprobe AM-530 TRMS electrical multimeter is an upgrade of Amprobe’s AM520 and AM510. It has improved features and functions already existent in the previous amprobe multimeter versions. It is the perfect tool for any electrician, whether an amateur or a professional in the field. This meter features true RMS that accurately measures voltage and current in all possible conditions including noisy locations. It has the ability to measure resistance, frequency, capacitance, temperature and voltage from 750 V AC to 1000V DC with high accuracy. The Amprobe AM-530 also measures alternating and direct currents (AC/DC) of up to 10 amps. Furthermore, it provides accurate voltage of up to 600V. This meter has other features like audible continuity, diode testing, data hold, non-contact voltage detection and a built-in flashlight. It is designed with LCD display with backlighting useful for working in poorly-lit areas. This meter has an auto power-off mode which helps in preserving battery by automatically turning off within 15 minutes of inactivity. It also has an indicator which lets you know when the battery is low and needs replacement. Additional features present in the Amprobe 530 include a MAX/MIN memory, auto manual ranging, CAT III 600 V and CAT III 1000V safety rating. These are some of the reasons why the model is so highly regarded in the electrical tools industry today. This multimeter is just the perfect addition to an electrician’s toolkit. There are definitely several reasons why this model has remained a trusted brand for many years in the electrical tool kit industry. Despite some of its flaws, this multimeter beats most other types of multimeters in its category based on customer reviews. It is therefore, highly recommended to professionals and DIY electricians who want to improve their work with the best multimeter in the industry. 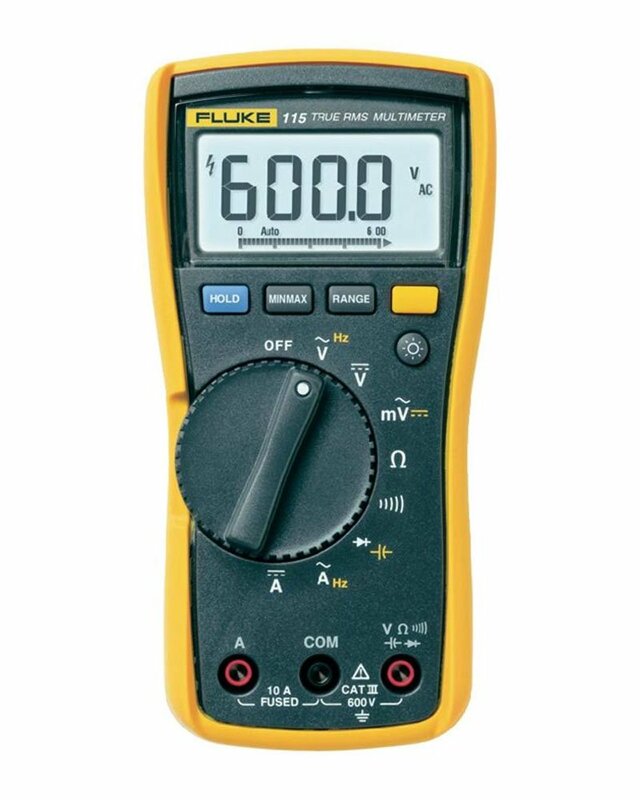 The Fluke 117 True RMS multimeter is a member of the Fluke series of multimeters. It has distinctive features that make it a highly suitable multimeter option for demanding settings and buildings like hospitals, schools and other commercial environments. Apart from the voltage, resistance, current and measurement capabilities, the Fluke RMS multimeter also has the ability to measure frequency and capacitance. Although cheaper than most multimeters like the 87 V, it still functions equally well in measuring electric currents and voltages. It allows for measurement of a diode and even the current path. If you are looking for the best multimeter, this one will definitely serve you well. The Fluke 117 RMS multimeter is an electrician’s design multimeter built in the USA. It is substantially smaller than other Fluke meters and weighs only 400 grams. This model is also ergonomically designed to provide you with an easy and compact hand grip while operating it. It has a salient non-contact detection feature which helps to prevent secondary voltage detections by other tools. The electrician’s Fluke 117 RMS multimeter also features true RMS for accurate detection on non-linear loads. One of the most important features of this model is the low impedance measurements which is highly valuable for preventing inaccurate readings due to ghost voltage. There are features like the large LED display with white backlights that works well in areas with poor lighting. The Fluke RMS 117 has a min/max/average feature that records fluctuating signals and it also comes with a volt alert which detects non contact voltages. Other features of the 117 meter include CAT II 600 rated safety, compatibility with optical magnetic hangers for hands-free operation and a 10A measurement with a 20A overload within a period of 30 seconds. With all the features, it is quite amazing that it is sold at a very affordable price compared to other similar products. This is a budget multimeter for most electricians. It is important to note that given its inability to measure milli amps and micro amps, it might not be suitable for all types of electrical appliances. However, for DIY electricians and other professional electricians, this model will definitely do the job. It is a good investment for electricians who are involved in commercial operations. If you are looking for a low budget multimeter for simple electrical jobs, there is no better option than the Fluke 117 True RMS Multimeter model.